DEKTITE PREMIUM are made of EPDM or Silicone, they are compounded specifically for maximum resistance to weathering due to ozone and ultraviolet light. 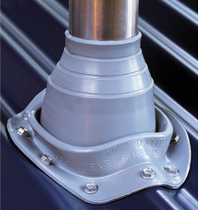 The base is designed to form a seal on most panel configurations and roof pitches regardless of the pipe’s location. RETROFIT ORIGINAL is used when it has to flash around, not over, due to difficulties in reaching the top of the pipe to insert it. DEKSTRIP Flashing forms & stretches to solve all those flashing problems: flashes hi-rib & standing seam profiles, stretch and form to fit & seal, flash between dissimilar materials, handles vibration & expansion, covered with 20 years warranty. 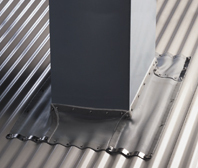 FAST FLASH is self adhesive and very workable lead replacement: Light weight & easy to trim and fully self-adhesive, allows time for repositioning, malleable & stretchable, dresses well to all profiles, suitable for any roof project.